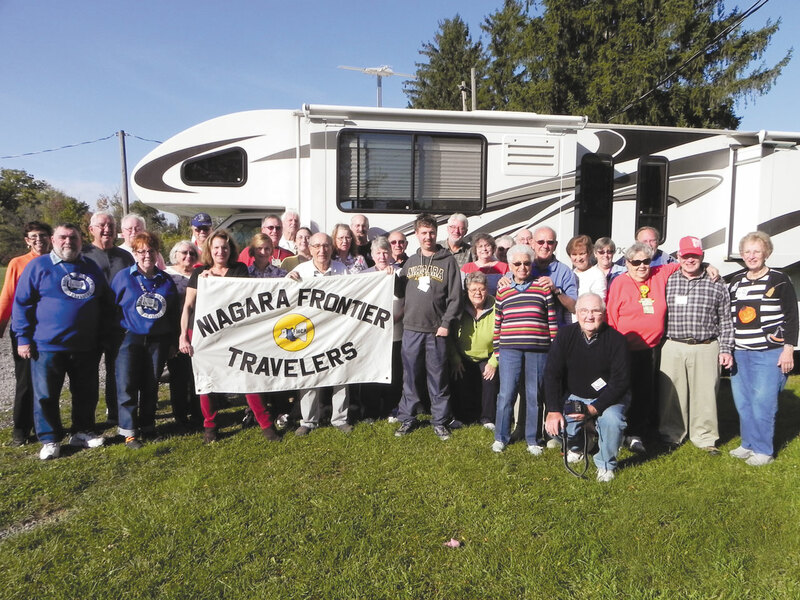 Niagara Frontier Travelers gathered in East Aurora, New York, to celebrate their 40th anniversary in 2016. The Niagara Frontier Travelers chapter encompasses the eight-county region of New York state found around the Niagara River area, called the Niagara Frontier. It’s west of the Finger Lakes, and dotted with little towns and campgrounds. Dr. Bonnie MacGregor, a retired educator, is the group’s new president. And a good storyteller when it comes to describing the chapter. One story starts about 40 years ago, back when the Niagara Frontier Travelers would go up to southern Ontario, Canada, and hold rallies with Canadian chapters. Among the Canadian group was a boy with his parents, who later remembered the fun he used to have. “He recently connected with us,” Bonnie said. The reunion was sparked when he saw one of the Niagara Frontier Travelers’ rallies listed in the “Events” column of Family RVing magazine. “That first rally he visited us was quite a time; he had so much fun and told us so many stories — and joined our chapter!” Bonnie said. The group welcomes new members who belong to FMCA, whether they own motorhomes or towables. Admittedly, some of the 25 member families are winter snowbirds. Which brings out another story from Bonnie. “When the people who go to Florida are gone, we have an Ice Birds luncheon a couple times in the winter,” she said. This year’s Ice Birds almost froze, though; snow had started when they met, and afterward, they barely made it home before a total of 3 feet fell. Upcoming Niagara Frontier Travelers rallies are listed in FMCA’s “Events” column; to visit a rally this summer, email Bonnie at the address listed below before you come, just to be sure space is available. “I would not like to turn anybody away for any reason,” she said. Go, visit, and join, and you’ll have yet another story: your own. For more information about the chapter, email Bonnie MacGregor at niagarafrontiertravelers@gmail.com. The chapter has an email newsletter that she can send you as well. For general information about FMCA chapters, contact the Chapter Services Department at (513) 474-3622 or (800) 543-3622; chapters@fmca.com.